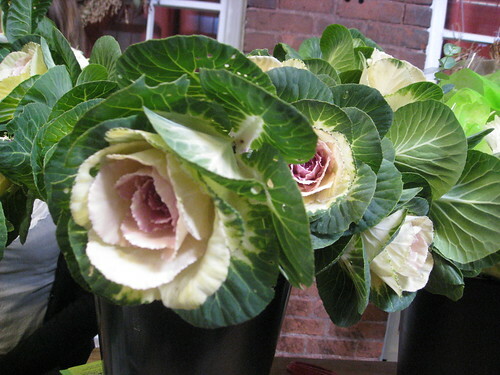 The first is the floral cabbage rose, which is an old-fashioned variety of genuine rose. It has many petals densely packed so the shape of it resembles a cabbage head. The second is what I call the vegetable cabbage rose. Also known as ornamental cabbage or ornamental kale, it's a variety of these familiar vegetables that's bred for beauty rather than flavor - although apparently it's still edible! The first two pictures show the floral cabbage rose. The second two show the vegetable "roses." And now I know what details and colors to use to finish my art piece~!